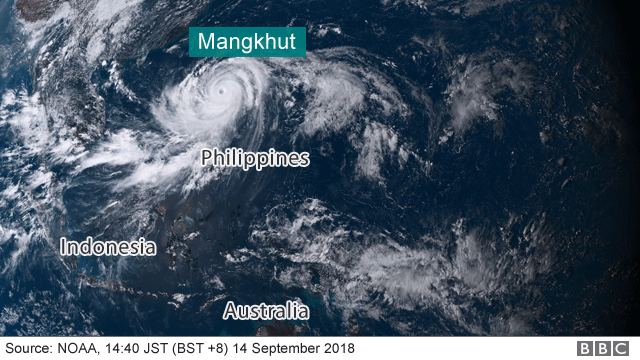 Super Typhoon Mangkhut is descending on the Philippines and is expected to make landfall early on Saturday. Forecasters say the typhoon, with winds of 205km/h (130 mph) and gusts of up to 255 km/h, is the strongest storm of 2018 so far. More than four million people are directly in the path of the storm - and thousands have been evacuated. Officials have warned of storm surges of up to 6m (20ft) and "very heavy damage" to vulnerable structures. The deadliest storm on record in the Philippines is Super Typhoon Haiyan, which also sparked category four alerts. Typhoon Haiyan killed more than 7,000 people and affected millions in 2013.